Goldenhills UMF Manuka Honey 16+ has a very high UMF rating and comes from New Zealand produced by a family company with a passion for quality and great manuka honey. Goldenhills UMF manuka honey comes from the pristine countryside in the North Island of New Zealand. The family owned company has is licensed by the Unique Manuka Factor Honey Association and for this reason Goldenhills manuka honey carries the important UMF manuka honey label, which means the honey has been tested according to stringent standards and criteria. UMF manuka honey is honey that has been tested and graded to ensure that it contains specific natural markers, including something called methylglyoxal. This is the naturally occurring element in manuka honey that scientists have identified as being responsible for the honey’s unusual properties that are different from other types of honey, and which have become world famous. Goldenhills manuka honey is produced by the Haddrell family and the company began as a hobby in 1993 with 15 hives has now grown to a medium-sized family enterprise that has 2,500 hives and exports to Asia and the US as well as the UK. 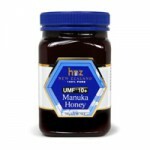 Goldenhills UMF Manuka Honey 16+ is quite a high rating on the UMF scale and the honey has the classic taste of manuka honey: an intense infusion of herbs and toffee. Honey is such a versatile product and can be used as a natural sweetener to refined sugar, and can also be used in cooking and baking (children under the age of one should not eat honey though). Manuka honey has gained a worldwide reputation and there are numerous scientific studies on its effect as well as plenty of anecdotal accounts of the benefits of manuka honey. But Goldenhills UMF Manuka Honey 16+ is at its simplest a delicious honey – try it and see! Queen Bee honeys are delicious and creamy - taste them and see for yourself! 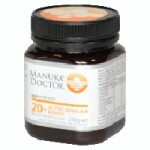 This Queen Bee Manuka Honey 20+ is one of the strongest in the Queen Bee range. Manuka Doctor Active Manuka Honey 12+ is a delicious and natural product made by busy bees in the pristine landscape of New Zealand. Manuka honey is a distinctive honey that will leave you hooked on its taste. 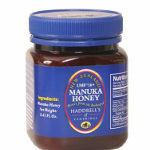 Wedderspoon is well-known for its high quality raw manuka honeys. The company uses its own rating system that tests many different elements. Try it and see! Queen Bee manuka honey with the highest Total Activity rating of 25+. This is a double pack of Queen Bee's strongest rated manuka honey. Creamy and delicious! 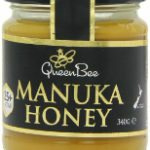 A high quality manuka honey from Manuka Doctor - sourced in New Zealand. The classic taste of manuka honey will leave you wanting more. Haddrell's 16+ Manuka Honey has a high Unique Manuka Factor (UMF) rating so you can be assured you are getting a genuine manuka honey that has been tested. Now you get on with your life and and wherever you are you need not be without a quick boost of Wedderspoon's Raw Manuka Active 16+ Honey with this handy pack of 24 pouches. Perfect for to take with you so you can enjoy whenever you need a pick-me-up! If you have already tasted the great taste of Honey New Zealand UMF 10+ Manuka Honey, this larger 500g jar may be what you need to ensure your household doesn't run out of this amazingly delicious and healthy product made by hard working bees in New Zealand.